Gracie Desperately Needs a Home! Gracie--easily the most affectionate and companionable cat we have ever met--has been close to adoption so many times I've nearly lost count, every family has backed out for reasons entirely unrelated to Gracie herself. Gracie's life has been one long streak of bad luck. She was born stray, taken in by the Humane Society, returned due to family misfortune, then adopted again. I knew her second family, and they were devastated when they had to give her up. My sister was kind enough to take her in back when Gracie was one of only two cats in the house. She did so well for so long, as did Gale, but then Gale lost perspective on the number of pets she could reasonably care for, and Gracie began being neglected. It was only just starting to improve when Gale died. 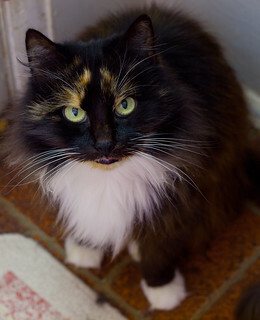 We so desperately want lovely Gracie to land on her paws that we've taken her to our vet to get all her shots updated. Gracie is in VERY GOOD health despite spotty veterinary care for the last decade. Yes, she's no longer a kitten, but don't let her 12 years deter you. We've personally cared for very ill cats that lived great lives until 18-19 years. Gracie isn't sick at all, and she has endured conditions that left other cats at that farm in bad health. She's tough, so imagine how long she's got ahead of her when in an attentive home! She is confirmed clear of any transmissible cat diseases, had no worms at her last vet check, has been spayed, and she's even microchipped. I will provide you with a copy of our vet paperwork. 1: She is allergic to fleas, and her coat suffered the consequences because my sister ignored the problem. When in full fluff, she is spectacular. Even now, she's gorgeous, and the patches in her coat are starting to re-grow. You may want to get her professionally groomed to get her off to a good start. Our vet indicated she should be in a home with indoor-only pets. He also recommended monthly, topical flea treatment as a precaution. It needs to address the full life cycle of a flea: egg, larvae and adult. He recommended Advantage. We will send her to you with a starter supply. Gracie has her front claws. She is used to living in a high energy household with with a small dog, and, obviously, lots of cats (in other words, she can hold her own). However, she also adores attention and would not mind being your only cat provided you don't mind a cat that wants to spend lots of time with you! She's great with kids and is very much a "people cat." For info, please leave a comment here or mail me at lawsontl at woh dot rr dot com. I need your EMAIL address and a working PHONE NUMBER if you are interested. I have had too many people do "drive-by" inquiries that got my hopes up and wasted her time as well as mine. I will ask the adopter to sign a simple contract before finalizing just to ensure she gets the same or better home than what she has now. When I get your email, I will send the contract to you immediately so you can review before committing to anything! Thank you so much for your consideration.